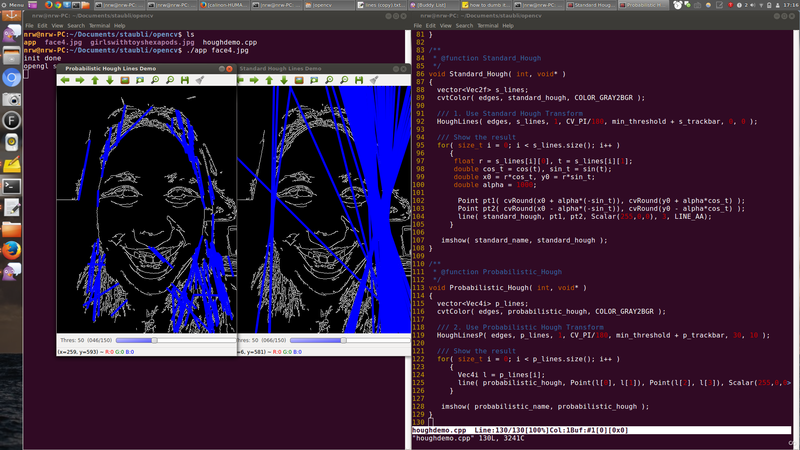 For the robotart.org competition, with a ton of help, I’ve gotten a 6 axis arm to work (it accepts x,y,z coordinates). Man, canny edge detectors on faces look super creepy and not at all recognizable. Also, I don’t think Hough is the way to go for recognizable faces. Alright, so what are some alternative approaches? Alright, not quite doing the trick.. Okay, there’s this sweet 2004 paper “Example-Based Composite Sketching of Human Portraits” that Pranjal dug up. They essentially had an artist generate a training set, then parameterized each feature of the face (eyes, nose, mouth), and had a separate system for the hair. The results are really awesome, but to replicate them, I’d have to have someone dig up 10 year old code and try to get it to run; or generate my own training set, wade into math, and code it all by myself. Given my limited timeframe (I essentially have two more weeks working by myself), I should probably focus on more artistic and less technical implementations. Yes, the robot has six axis, but motion planning is hard and I should probably focus on an acceptable entry or risk having no entry at all. An approach that would be slow but would probably capture the likeness better would be to get stippling working. Evil Mad Scientist Labs wrote a stippler in Processing for their egg drawing robot, which outputs an SVG. Presumably the eggbot software converts the svg to gcode at some point. Think about what I want to convey artistically. What would look nice yet be easy to implement? First, inspiration. 250 year old writer automaton, you can swap out cams to change the gearing and change what it writes. Crazy! okay, so more modern. this robot arm uses the Hershey vector fonts to draw kanji. Turns out there is an open source SVG font for Chinese (Hershey does traditional chinese characters, not simplified) so now I can write messages to my parents :3 if I can convert the svg to commands to the robot. Evil mad scientist labs has done some work on the topic. This seems tractable. The key step seems to be SVG to gcode. Seems like I should be able to roll my own without too much difficulty or else use existing libraries.